During two trips to Burma (Myanmar) in the past year, I initially felt surprised to experience widespread enthusiasm to speak openly to me, outsider as I am. The openness I was so frequently greeted with amazed me. 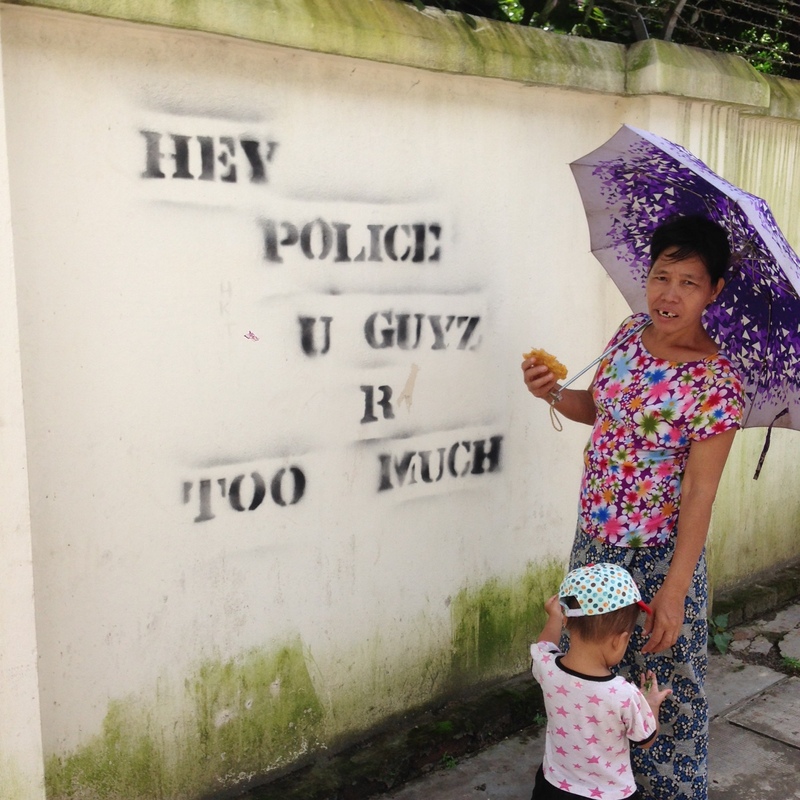 Locals felt completely at ease about discussing the politics of their threatened totalitarian regime in my presence. With a powerful female figurehead now at the country’s helm, it is high time for the women of Burma to come to the fore. Their unique voices can finally be heard by the international community and their previously untold stories can be deservedly shared with the world. Thus, I am proud to announce the launch of a series of interviews with women of Burma. Numerous encounters on my travels around Burma kindled this project into existence over several months, with several individual and group interviews occurring in early 2016. However, the initial idea was sparked by two very different women, whose names I never learned and whose uninhibited conversation seemed to offer as much to them as to me. All interviews were conducted in person, with the participants’ full consent for publication. However, the first two encounters took me by surprise. Given the spirit of the conversation, I believe they demand publishing despite explicit consent not being given. I feel it only right to honour the two women whose words became instrumental to this project. These women made it clear they wanted their voices to be heard by anybody in the international community they could reach. After a 5am motorcycle lift from the beach resort at Setse to the small town Thanbyuzayat, I learned that my bus was an hour later than anticipated. Disappointed, I found myself spending an hour consuming a Burmese breakfast of warmed but still near raw egg and strong Burma tea. I watched the daily procession of monks file through the streets collecting their breakfasts from neighbourhood women with buckets of rice. I would soon board the bus for a 13-hour ride from Thanbyuzayat to Yangon via Mawlamyine. My two weeks of solo travel in Burma were coming to an end. Women don’t go anywhere alone. I travelled alone. As in most places, I was warned against travelling alone. Of course, I know that travelling solo anywhere is potentially dangerous. I had travelled abroad alone before. I was aware of the possible dangers, and I felt well prepared to take care of myself. But this warning had a different origin. In Burma the primary concern was not safety but adhering to socio-cultural norms. While I was happy to follow other social rules I’d read about, Lonely Planet’s advice against solo women travellers went unheeded. I was sitting alone on the bus somewhere between Mawlamyine and Yangon, minding my own business, when the woman sitting next to me switched with the woman in the seat in front of her. She offered me fruits I didn’t recognise and began to chat amiably, taking me under her wing, as many other women had, for the duration of the journey. The two women were travelling together with a third who was sitting directly in front of me, but only one was confident about her English speaking ability. She was a Church minister and Sunday School teacher from Mon State, going to Yangon to visit a man from her local parish who was in hospital in the city. She had reached out to make sure that foreigners understood as much as they could of the cultures in Burma. Her words have stayed close with me ever since. 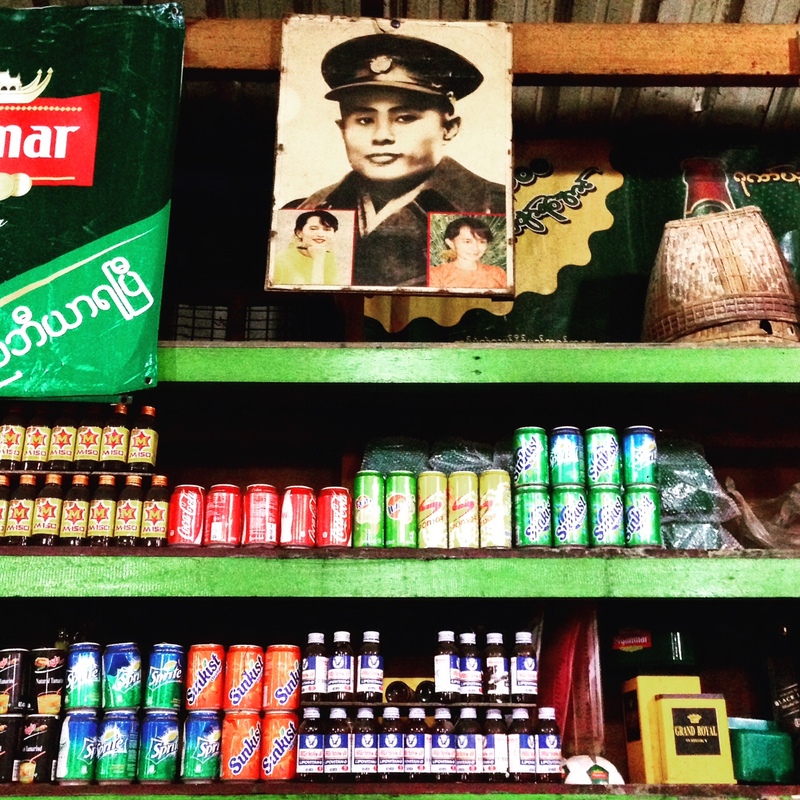 They seem to encapsulate an ambiance I felt throughout my travels in Burma. Pausing at a busy junction in downtown Yangon as I waited to cross – a heavy bag on my back, obviously a tourist – an older Burmese woman muttered under her breath telling me it was safe to cross. The midday heat had begun to settle between the traffic and would not lift until the usual downpour around four. The woman moved slowly but was still close enough when we reached the curb opposite to continue the conversation. My impulse was to speed ahead but she wasn’t finished with me. I slowed my pace to match hers and listened. When this loquacious older woman shared her political views with me, I didn’t have to ask who ‘she’ was; she needn’t be named. She’s been on my mind constantly since I began seeing her photo pasted next to her father’s portrait or twinned with posters saying NATIONAL LEAGUE for DEMOCRACY above people’s houses, outside shops and in restaurants all across the country. Aung San Suu Kyi, it seemed, was all anyone could think about. If they let her in, there will be changes. If not, things will be stable. Aung San Suu Kyi has been the national beacon of hope since 1988, when she founded the opposition party National League for Democracy. Everyone knows her name, but she is often referred to as ‘The Lady’, or simply ‘she’. She has spent almost 15 years imprisoned in her own home since 1989, separated from her family who were based in Oxford, England and not granted visas to visit her. It took Suu Kyi and her party 28 years to gain power in the national government. She spent those 28 years either under house arrest, showing support for her people’s protests against the army government or undertaking nation-wide campaigns to unite the many ethnic groups in Burma. I sensed from context and her tone that when my new friend referred to things remaining ‘stable’, I was to infer that unchanging political leadership in Burma would mean only bad things for the education system already in dire need of alteration. Education was a primary concern many of my new acquaintances in-country raised with me, especially in early 2016 after NLD had begun to adopt political power. Many people have faith in the changes NLD will bring, but worry that things cannot change fast enough for today’s students. How the Burmese education system will develop, only time will tell. Open Mouths: Free speech in Burma? Pausing at a busy junction in downtown Yangon as I wait to cross, a heavy bag on my back, an older Burmese woman mutters under her breath telling me it is safe to cross. The midday heat has begun to settle in the gaps in the traffic and will not lift until the daily downpour around four. The woman walks deliberately slowly but is evidently still close enough to me when we reach the curb opposite to continue the conversation. My impulse is to speed ahead but she isn’t finished with me yet. So, I slow my pace to match hers as she tells me that I must be surprised her English is so good because I have met so many Burmese people who cannot speak proper English. She continues: All the young people in Burma are getting a bad education at the national schools and are having to pay for extra tuition (with the same teacher) outside school time – a scheme deeply entrenched in the country’s economics . They do not learn good English, my companion assures me. Even the doctors here do not speak English; if you explain your symptoms in English – which is a more appropriate language for medical issues – they will complain and presume to charge you the “international price”, a high rate in US Dollars, not Burmese kyat. The woman explains: This is all because the education minister will not get out of his seat (either to do any work or to make way for a minister who will do the work). When she grew up, the British education system was still in place – that is the reason she speaks English so well . But now, only private international schools teach good English. That’s why the Number One sends his children overseas, to western schools. Everyone knows he’s been putting money into overseas banks for years; he is ready to flee if anything goes wrong for him here. When my talkative new advisor shares her political views with me, I don’t have to ask who ‘she’ is; she needn’t be named. She’s been on my mind constantly since I began seeing her photo pasted next to her father’s portrait or twinned with posters saying NATIONAL LEAGUE for DEMOCRACY above people’s houses, outside shops and in restaurants all across the country. Aung San Suu Kyi, it seems, is all anyone can think about in Burma. ‘If they let her in, there will be changes. If not, things will be stable.’ Like her father, Aung San, once was, ‘she’ is the vehicle of hope that carries Burma ever onward to the upcoming November 8th election. With that, this loquacious older woman turns left down a side street going south, muttering goodbye as she walks. I have barely uttered a thing but small signs of interest and encouragement since we crossed the road. I didn’t even get her name. Though I am desperately trying to remember every word this stranger has shared, I am not surprised by the sharing itself. In fact, I have found openness is a vital element of Burmese social interaction. My time in Burma quickly taught me that people are ready to talk. People have long been ready to talk. They just have to meet the right audience. This encounter enabled me to understand what I had already been hearing, and pushed me to be there to listen at a time when Burmese people were ready to open their mouths. First, he explained that votes (for a chosen party, rather than a specific candidate) are cast at monasteries. As far as he knows, monks do not or are not allowed to vote; monks (a huge percentage of Burma’s population) remain impartial. Perhaps this impartial group counts the votes? It is not clear to Koko who counts the votes or how the monks are involved . He observed that the ambiguity of the system is one way the USDP maintains significant power in modern Burma, despite the semblance of democracy in which a huge percentage vote against the USDP. Secondly, while four of us slide and stumble down a steep muddy riverbed, Koko explains the relationship between family and politics in Burma. Family members usually vote the same way; young people, able to vote at 18, generally follow their parents voting tendencies. Very rarely do people vote differently from their family – if they want to, the individual will try to persuade the family of his or her reasoning, explaining their motives for this choice, and vice versa. The family will try to come to a resolution by which every family member will vote for the same party. If they cannot, there is no pressure against voting differently; we vote for whoever we want to win. Talking about voting preference usually stays within the family, or perhaps as far as the extended family or close community members. It is dangerous to discuss political matters with anyone you do not know well because there are government spies who will infiltrate communities or small villages, gather information and report names to government officials who will deal with opposition voters or troublemakers as they see fit, Koko tells me. It can be extremely dangerous to speak openly in public. 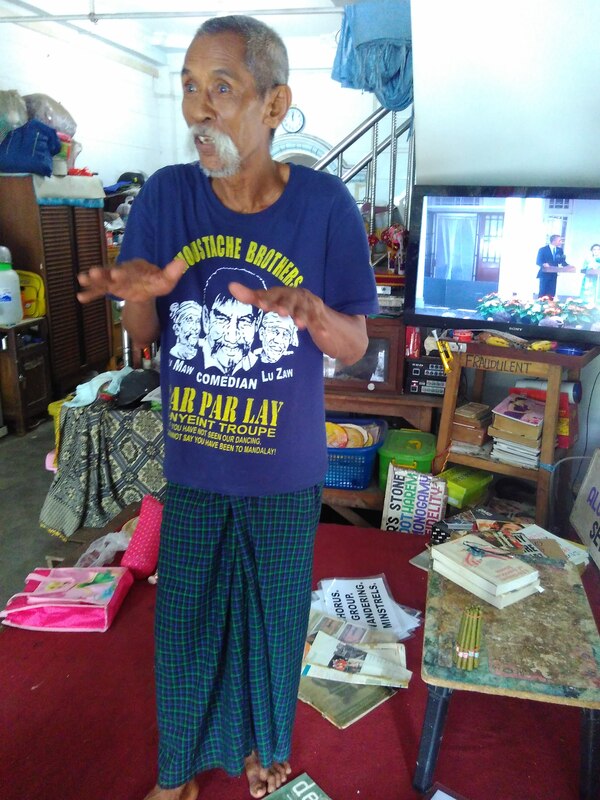 In need of dental care, Mr Moustache leaves his home in Burma and crosses the border in order to see a dentist in Thailand. Dentist: Don’t you have dentists in Burma? Moustache: We do, but we are not allowed to open our mouths! The Moustache Brothers were once a trio (two brothers and their cousin), who were known for their traditional A-Nyeint  comedy shows. Two were imprisoned for a stretch of 7 years as a result of a well-attended show at Aung San Suu Kyi’s residence in Yangon. One of the brothers, Par Par Lay, died in 2013 from lead poisoning – a complication relating to his long-term imprisonment after working in a labour camp. 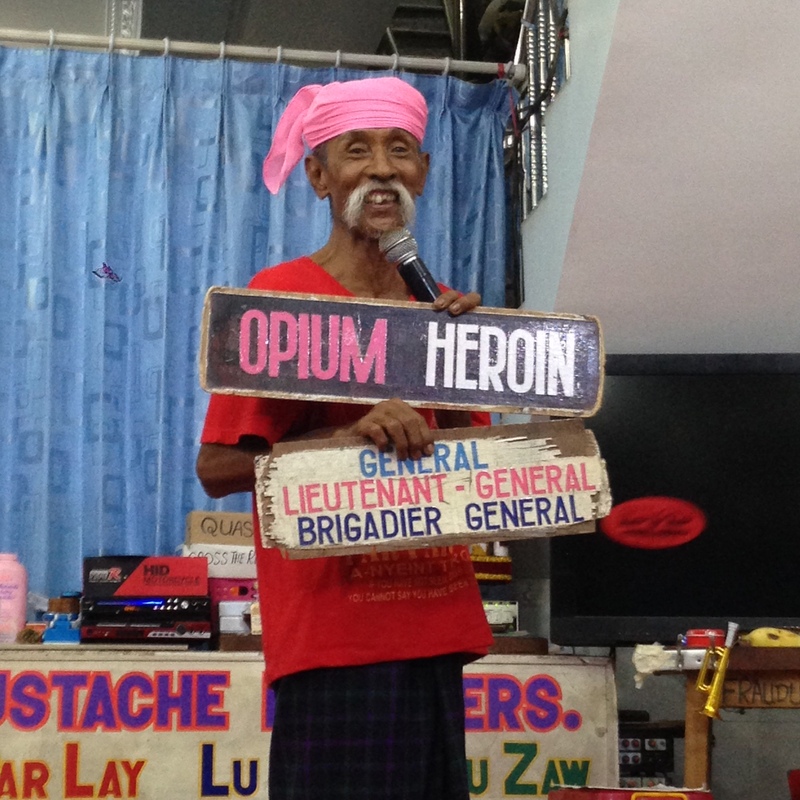 Lu Maw, the remaining brother, still shows off his fine moustache, his corpus of English idioms, and his family’s talent at nightly comedy shows in Mandalay. He is not free to perform publicly. Instead he invites tourists into his home, despite the risk it poses for his huge family who live and perform with him. For him, the danger has always been there. It will not cease to exist until those in power move over and allow democratically elected leaders into government. Lu Maw has been speaking his mind for decades. He has consistently been one of a few individuals unperturbed by the danger still alive. In days past, many voices have joined in and been snuffed out through acts of mass violence, such as the Saffron Revolution of 2007. The threat of real violence is enough to keep many people silent, most of the time. But now, mouths are opening throughout Burma. Koko said that he can speak freely (fairly freely) now, because there is an election coming up on November 8th. The date was announced about a month before I met Koko in August 2015. Normally, though, one has to be very careful when speaking about politics. The upcoming election is an excuse for Burmese citizens to speak freely, for a change. I saw signs outside shops, billboards in the city, and houses blaring music and displaying posters. On September 6th, exactly nine weeks before election day, political parties were finally able to campaign and so began parading through Burmese cities to rally support. The USDP volunteers were sparse and sour faced as they drove around Mandalay. 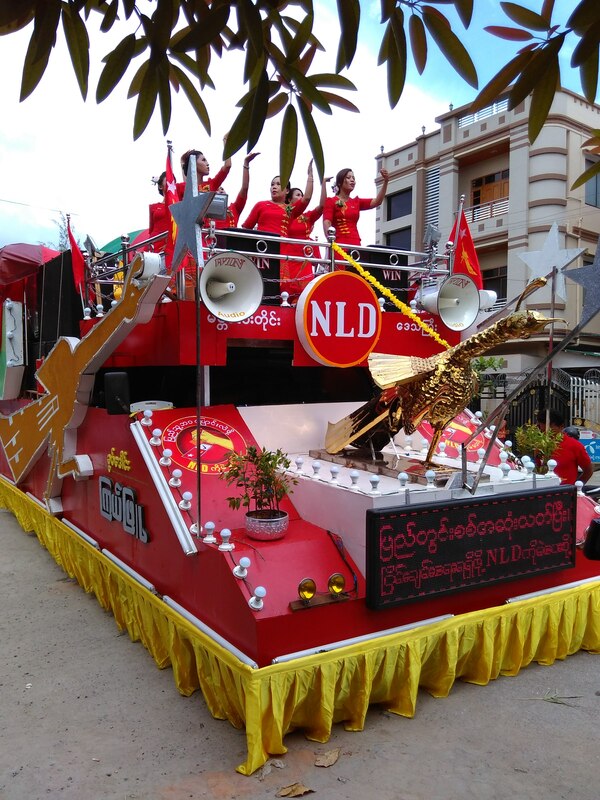 NLD on the other hand, were cheery and plentiful; in each neighborhood people poured out of their homes and businesses to greet the motorcade and big bus decorated with the party logo and a huge image of Aung San Suu Kyi, topped off with resounding music and a team of beautiful dancers on the roof. Zin Mi, Lu Maw’s daughter, recounted the rallies leading up to the 2010 election , when her uncle Par Par Lay was still alive. In those days, the famous comedian joined the motorcade on his motorcycle, garnering support for the NLD. He told people: do not be afraid. They liked and trusted him, so many emerged to show their support for the NLD due to his encouragement. Zin Mi grinned at me with every new piece of information shared; apparently not many foreign tourists have shown a deep interest in the Burmese elections, let alone bought an NLD t-shirt. Fondly remembering her uncle, she assured me that she is not afraid. However, many peaceful activists and human rights defenders have recently been arrested and imprisoned in the run up to November 8th. Showing no fear is not enough. Why open up to me? On several occasions, people asked whether I was Burmese. They did not simply ask where I am from. Instead, they wanted to know: ‘Is your mother Burmese? Your father?’ and I soon believed that I look a little Burmese. Perhaps it was just a case of wearing the right clothing (a longyi, t-shirt and sandals) and behaving modestly? While I was wearing my NLD t-shirt I got the thumbs up wherever I went – even from a security guard in customs at Mandalay airport – a sign of appreciation for the NLD. But I’m not convinced a Burmese man (for it was mostly men) would truly believe an Englishwoman to be Burmese, despite my being dark-haired and tanned. No, I believe these curious passers-by were trying to gauge their audience, trying to judge whether my apparent interest in their country rendered me safer or more dangerous to divulge honest opinions to. The bright red NLD shirt, it seemed, encouraged NLD supporters to communicate with me upon common ground: a mutual love of democracy and hope for Burma’s future. On meeting the elder Burmese woman on the street corner, I was not yet wearing an NLD shirt, just a large, heavy backpack, sunglasses and loose trousers. It was clear to everyone around me that I was a tourist, not a local, nor was I living in Yangon. I had just arrived in Yangon and was quickly approaching my final week on a 28-day visa. I knew virtually nobody in the city, and likely had no relationship with any kind of minister or official. Koko gave me the impression that most foreigners he’d met had not asked him about political matters. The Lonely Planet guide to Myanmar (Burma) instructs tourists to tread carefully when approaching Burmese people about political issues. Is it surprising that that wariness becomes fear under the watchful eye of the military junta? Tourists passing through can hardly be expected to put their safety at risk when they’re just trying to see some more golden pagodas. Yet this young man could hardly have been more eager to discuss details of the Burmese political system, when asked. As soon as he understood he could trust me not to rat him out to the Burmese government, all he needed was a prompt. It is clear that on the Yangon street corner, a quick glance was all that this woman needed to rest assured I was safe. Others asked whether I am Buddhist. Everyone I spoke to found an (any) excuse to begin talking with me and, later, turned the conversation towards politics. In the grand scheme of things, foreigners do not matter inside Burma. But outside? Foreigners have potential for far greater power outside Burma. Tourists go home and tell the world how kind the Burmese are, how cheap their trip was and how beautiful the scenery is. All this is true. But what tourists should be telling the world is: People in Burma are oppressed and we can help. Various non-governmental organisations (NGOs) are working in Burma (Myanmar) and doing a lot for people’s general wellbeing, particularly in small communities, but are limited as to their influence upon the political system. Amnesty International has been conducting research and aid work in Burma since May 2012. AI reports state that positive changes have occurred and the Burmese government have taken some steps in the right direction, but major human rights abuses continue. Their most recent report shows: ‘Despite ongoing political, legal and economic reforms, progress on human rights stalled, with some backward steps in key areas.‘ In fact, it seems that repression has actually increased in the past two years, with high numbers of people being imprisoned for exercising their rights ahead of the November 8th election. Amnesty International is calling upon the Burmese government in a new campaign to free prisoners of conscience, launched October 8th 2015. Read more about prisoners of consicence here, about AI work in Myanmar (Burma) here and here. Oxfam’s most recent work in Burma has been focused on providing aid for victims of the flooding in Northern Burma in summer 2015. Oxfam works to improve governance in Burma, tackle poverty in rural farming and fishing communities, and help improve women’s rights and access to leadership roles. However, donating to Oxfam will not direct your money towards helping people specifically in Burma, as it is a major international organization helping people worldwide every day. Read more about their work in Burma here. US Campaign for Burma, Burma Campaign UK and Burma Partnership are just a few of the smaller NGOs dedicated entirely to improving lives in Burma. Help Burmese voices be heard by signing Amnesty International’s petition to the European Union, UK, USA, Australian, and Japanese representatives in Burma. Click here to help free all prisoners of conscience. You may need an international organization to help you petition international representatives in Burma itself, but you can petition your local representative without a middleman. You can use the form provided, adapt it or write your own message, but make sure to include the hyperlinks therein. Scroll down for instructions on how to contact your local representative. There are various Ways to Contact Your MP. Here’s how to Find your local MP. You can Contact your Representative. Or Contact your Senator. Search to Find Your Electorate here or Find your local Member here. Read the Guidelines for contacting Senators and Members. Also read How to Get Politicians Attention. To contact your Ward Counsellor you must contact the Customer Care centre of your municipality. Ward counsellors have offices and consultation times. To contact your Municipal Counsellor or MMC, find their contact information on your municipal website (all the municipalities have websites). To contact your Provincial Counsellor (MEC) you must go through the relevant departments (e.g. if you want to contact the MEC of Health for the Gauteng Province, look on the Department of Health website for the contact information). It is highly likely that you know far more about how to contact politicians in your country than I do. If you’d like my help, or if you know how to contact your local politicians and would like to see your country added to this list, please contact me. I am just one recent visitor to Burma with an opinion based on personal experience and what I have been told by locals. You can read more about international relations between Burma and the European Union here, and about the United Nations work in the Asia Pacific region here. That said, the international community seems to focus on the appearance of positive change (such as the announcement of a second democratic election following 2010’s election) as opposed to the harsher realities that NGOs are focusing on (such as prisoners of conscience and flood victims). For a reliable pro-democracy report, I read The Guardian’s news about Burma. Please share this article and/or the links therein – repost on your social media pages and email all your friends. The more people understand the current situation in Burma, the bigger difference we can make to further democratic progress in Burma. Children trying to sell things at tourist sites opine that they cannot afford the fees for extra tuition, not the actual school fees. Burma is one of the few countries in the world where parents are more educated than their children, due to a major decline in education standards since the military government seized power in 1962 (first as State Peace and Development Council (SPDC) later as State Law and Order Restoration (SLORC)). NLD = National League for Democracy, pro-democracy opposition party founded by Aung San Suu Kyi in 1988; USDP = Union of Solidarity and Development Party, headed by Sein Thein, current President of Myanmar. This autumn, the NLD began to circulate leaflets simply showing people how to ensure that their vote is counted. This included instructions on how to avoid spoiling the ballot and where they can go to vote. Monks can in fact vote. A few influential monks have drafted a bill preventing Rohingya Muslims from voting in elections and marrying Burmese Buddhist women. Burmese comedian Zarganar is famous for his satirical puns and wordplay, criticising the dictatorship. Unfortunately, the authorities know him too – of the past 30 years, he has spent over 10 in prison. A-Nyeint is a traditional style Burmese entertainment. Shows typically last all night and include a range of performances by different groups of actors, dancers, musicians, opera singers, and comedians. This is not the first election to have raised hope for the people of Burma, but is perhaps the first in 25 years that NLD have any chance of winning. The NLD won an overwhelming majority of votes in 1990, but the military junta refused to relinquish power. NLD boycotted the October 2010 general election, as Aung San Suu Kyi was still under house arrest. Few were surprised that the USDP won. The stories I heard of foreigners doing real damage involved tourists reporting a stolen item to the police. Whoever is accused (it often comes back to the bus driver if the item disappeared during a bus journey) may face long-term imprisonment, despite the lack of concrete proof. Aung San Suu Kyi has held a (largely nominal) seat in Burma’s Parliament since 2012. In 1990 the SLORC amended the constitution stating that anyone with foreign children cannot be President. This ammendment was designed specifically to keep Aung San Suu Kyi out of power – she and her late British husband, Michael Aris, had two children, Kim and Alexander. They were 15 and 13 on her return to Burma in 1988, shortly before house arrest began. Aris died in 1999).